These are my first Mac lipsticks. And I love the colours. See Sheer is a coral red orange colour and Sweetie is a mix of pink and fuchsia colour with silver shimmers. Because of the very sheer formula, you can build it up. But also because of the sheerness, the final colour depends on your lip colour. For everyday look I use just one or maybe two layers. 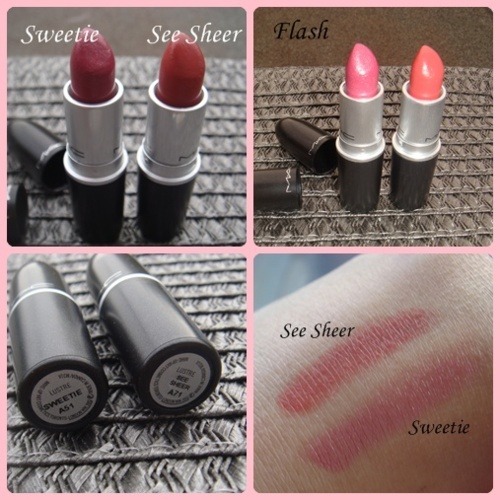 My lips are natural light pink, so these lipsticks give my lips more colour and life to it. As the autumn comes, my lips begin to be very dry and chappy. Unfortunately these are not very moisturising, so I do really need lip balm before applying these lipsticks. Overall: I really like the colour and the formula. But I do need a lip balm to moisturise my lips before applying the lipsticks.